Lake Houston Anglers Tournament - Lake Houston Fishing! Lake Houston Anglers Tournament every 2nd Saturday of the month is about to begin. Small entry fee to fish with lots of fun and chance to win cash back. The 1st tournament will begin on the 2nd Saturday in January. 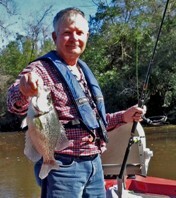 Tournament is $50.00 per boat to fish. Fish time are safe light to 3 pm. where can contestants get the Tournament rules and regulations. I believe everything can be found on Lake Houston Angler's Facebook Page. True that. Thanks my friend! We had 57 anglers joining us as we kicked off the 2017 season with our January Event here on Lake Houston. We had a 31 boats competing in the event with 86 fish being weighed in for a total of 176.40 lbs. Congratulations to our top finishers who placed in the money. A total of $2,795.00 in Cash was paid out. *Our Big Bass winner went to Joe Neumann with his Lake Houston Pot-Buster weighing-in at 5.43 lbs. This won him the $100 payout for 1st Place Big Bass in addition to the GIANT Big Bass 50/50 Side-pot which paid Joe an extra $1,350.00 after being rolled 7 times. Big Congrats Joe Neumann! 2nd Place Big Bass went to Greg Crawford with a solid fish coming in at 3.80 lb. which earned him the $50.00 pot. Please see the attached document for full the full 2017 Season Results. Our next tournament will be on February 4th out of Lake Houston Marina with the next meeting scheduled for January 31st at Cedar Landing at 7pm. We look forward to seeing you all then. If anyone wishes to be removed from our contact list, please feel free to let me know and I will be more than happy to take care of your request.